Today, the Mortimer & Mimi Levitt Foundation awarded $450,000 in matching grants to 18 nonprofits serving small- to mid-sized towns and cities across America to produce free outdoor concerts as part of the fifth annual Levitt AMP [Your City] Grant Awards. Reflecting the Levitt Foundation’s commitment to creative placemaking projects generating community support, the Levitt Foundation once again opened the Levitt AMP selection process to the public to choose the top 25 finalists. In June, the Levitt Foundation invited nonprofits to submit proposals that would reflect the three goals of the Levitt AMP awards: Amplify community pride and the city’s unique character; enrich lives through the power of free, live Music; and illustrate the importance of vibrant public Places. Nonprofits that received a Levitt AMP grant in previous years were eligible to reapply. The public voted on the submitted proposals over a three-week period in November, selecting their favorite projects online at levittamp.org. 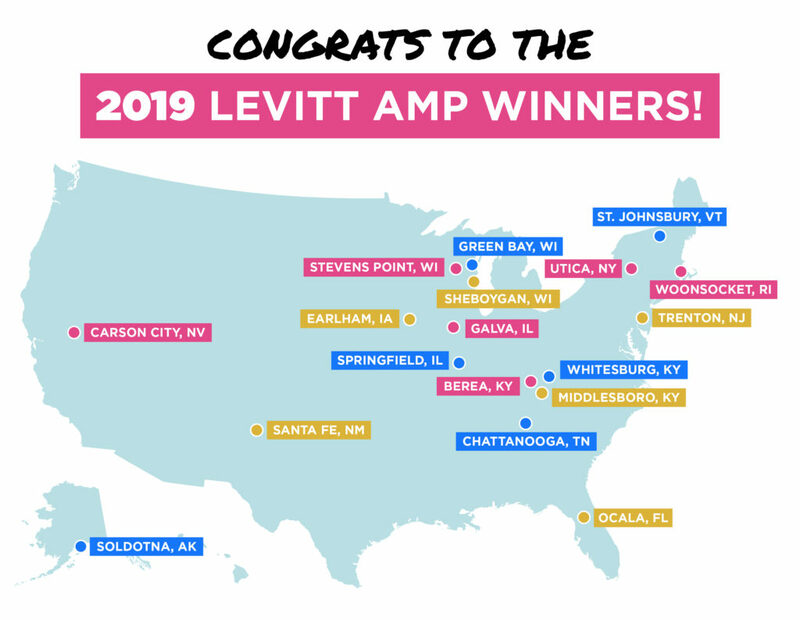 The 18 Levitt AMP winners hail from rural towns with populations of less than 5,000 like Earlham, Iowa; Soldotna, Alaska; and Whitesburg, Ky.; to mid-sized cities like Carson City, Nev.; Stevens Point, Wis.; and Woonsocket, R.I.; to larger cities spanning the country including Chattanooga, Tenn.; Santa Fe, N.M.; and Trenton, N.J. Each winner will present 10 free concerts featuring a diverse lineup of high-caliber entertainment as part of the Levitt AMP Music Series, for a total of 180 free Levitt AMP concerts across the U.S. in 2019. The Berea Arts Council will present the third Levitt AMP Berea Music Series, infusing vibrancy and inclusivity into the city’s Old Town Artisan Village while reenergizing a historic cultural district in the heart of Berea through multi-layered arts experiences. The 2019 series will continue to fuel Old Town’s economic recovery into a welcoming hub for art, food, and community gatherings. The Levitt AMP Carson City Music Series presented by the Brewery Arts Center will return for the fourth year to enliven the Minnesota Street Stage—a once abandoned street corridor that becomes a thriving cultural destination through the free concerts. The upcoming Levitt AMP series will deepen activation of the space, further solidifying the Brewery Arts Center’s role in fostering community cohesion and pride during Levitt AMP concerts and beyond. Jazzanooga will bring the third Levitt AMP Chattanooga Music Series to life on the Bessie Smith Cultural Center lawn in the historic Martin Luther King District, further energizing the area once considered a famed live music hub and center for African American community life. The 2019 series will further momentum to the ongoing community-wide effort to revitalize the area while celebrating its rich heritage. The first Levitt AMP Earlham Music Series, presented by Earlham Chicks with Checks, marks an exciting new chapter in the community-driven effort to transform Earlham City Park into an ongoing vibrant music-filled community hub. The Levitt AMP Music Series will elevate and expand upon the existing Earlham Summer Music Series, creating new opportunities for residents of this rural town to connect, enliven an underused public space and experience high-caliber entertainment. The Galva Arts Council will once again enliven Wiley Park through the second Levitt AMP Galva Music Series, further activating the large, underused green space into a dynamic hub for self-expression, connection and layered arts experiences set to free, live music from across the globe. The 2019 series aims to deepen community engagement and expand upon community partnerships, creating a weekly communal celebration of the best Galva has to offer. upcoming series aims to create a welcoming, community-wide destination for concertgoers of all ages and backgrounds to come together and enjoy a lively and eclectic lineup of music that reflects and celebrates the city’s increasingly rich diversity. Marion Cultural Alliance will present the third Levitt AMP Ocala Music Series on the Martin Luther King Jr. Recreational Complex’s once forgotten three-acre green Webb Field. The 2019 series will further activate this underused West Ocala Historic District landmark, building upon new momentum to create a vibrant gathering place that inspires a community-wide commitment to making art and culture accessible to all residents during and beyond the series. The nonprofit AMP Concerts will present the third Levitt AMP Santa Fe Music Series at The Santa Fe Railyard Plaza, deepening community engagement to provide a powerful weekly celebration of Santa Fe’s past, present and future through free, live music. The 2019 series will continue to elevate and expand upon the range of talent presented, creating a vibrant point of pride for Santa Fe residents of all ages and backgrounds. Vision Soldotna will present the first Levitt AMP Soldotna Music Series in Soldotna Creek Park on the banks of the Kenai River, celebrating the community-driven effort to transform a maintenance yard into a welcoming space for locals and visitors. The Levitt AMP Music Series will elevate and diversify the existing Music in the Park Series, bringing the community together to enjoy high-caliber talent while energizing the beautiful green space they have created. The first Levitt AMP Springfield Music Series will be presented by the Downtown Springfield Heritage Foundation to breathe new life into a large, vacant lot in Springfield’s historic business district where President Abraham Lincoln delivered his historic “House Divided” speech. The series aims to reignite civic engagement and pride, while bringing residents together to envision the future direction for a space that has lacked activation since 1978. Catamount Arts will present the third Levitt AMP St. Johnsbury Music Series on Dog Mountain, a breathtaking 150-acre, dog-friendly destination in Vermont’s Northeast Kingdom Rural Enterprise Assistance Project Zone. The 2019 series will continue to re-animate this former industrial area, bringing together “St. Jay” residents of all walks of life to enjoy diverse arts programming, drive economic activity and support the growth of a sustainable, year-round local creative economy. CREATE Portage County will present the third Levitt AMP Stevens Point Music Series in Pfiffner Park along the Wisconsin River, fostering a deeper sense of neighborhood identity and further illustrating the power of creative placemaking to strengthen a community’s social and economic fabric. The 2019 series will empower residents of all ages and backgrounds to come together and shape the future direction of the downtown and riverfront while enjoying free, live music. The Levitt AMP Utica Music Series presented by Utica Monday Nite will return to Kopernik Park in Oneida Square for the fourth year, expanding community engagement through layered arts experiences and deepening partnerships with underserved refugee communities. The upcoming series will continue to build a stronger, more unified community while inspiring further investment in the park and surrounding area. The Cowan Community Center will present the second Levitt AMP Whitesburg Music Series on the Mountain Heritage Festival Stage, further revitalizing the community’s downtown core through inclusive, high-quality arts experiences. The upcoming series will continue to transform the site of a former railroad yard and shuttered high school into a place where people of all ages and backgrounds can see, celebrate, and participate in the community as one. NeighborWorks Blackstone River Valley will bring the second Levitt AMP Woonsocket Music Series to life in River Island Art Park, continuing to reinvigorate the scenic, once bustling public gathering place in the heart of the city through engaging, family-friendly concerts. The 2019 series will continue to serve as a cultural, community, and economic catalyst for the city—bringing residents and local businesses together to celebrate and strengthen Woonsocket’s downtown area. Due to the tremendous impact they have made in their communities during the past four years, previous Levitt AMP winners Main Street Middlesboro, John Michael Kohler Arts Center and Trenton Downtown Association have each been awarded multi-year funding to present the Levitt AMP Music Series in their cities for the next three years. Through the Levitt AMP Middlesboro Music Series, Main Street Middlesboro has transformed a gravel lot into a vibrant gathering space complete with a volunteer-installed lawn and donated permanent stage. The 2019 series will build upon this momentum, augmenting the community-driven revitalization of its downtown and positioning the series for a wider impact. The Levitt AMP Sheboygan Music Series has sparked significant investment in the area while bringing people together downtown. The John Michael Kohler Arts Center will present the 2019 series in the city’s new City Green—once the site of a vacant large retail store, now an energized green space complete with a permanent stage in the heart of the city’s newly created Arts, Culture and Food District—celebrating this multi-year placemaking milestone. Trenton Downtown Association has made remarkable strides in strengthening the social and economic fabric of the state capital’s historic downtown core through the Levitt AMP Trenton Music Series, bringing together a richly diverse community through the power of free live music, while creating a thriving cultural destination in the centrally located Mill Hill Park. Congratulations to these 18 communities! Stay tuned for Levitt AMP concert dates and artist lineups on levittamp.org!